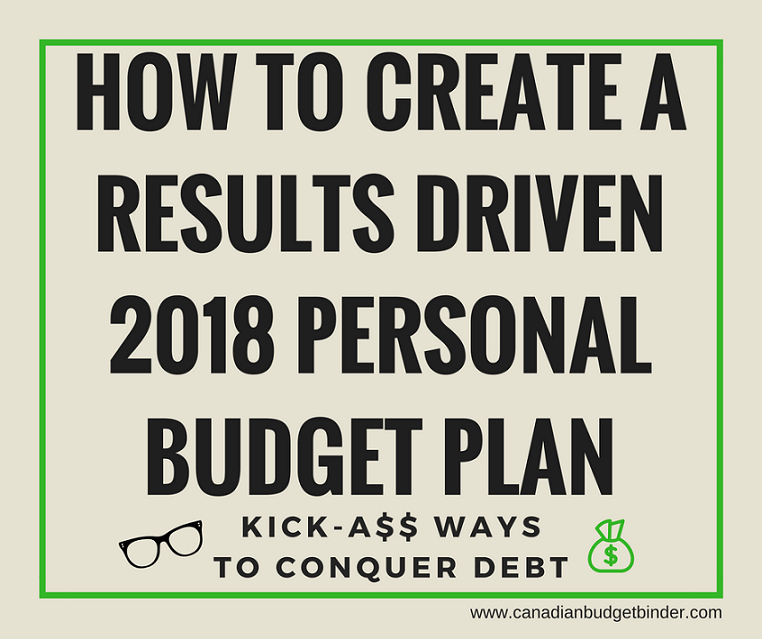 At the end of each year and during the first month of the new year I often get social media bombed by readers of this blog about creating a personal budget plan. It is often this time of year when debt weighs heavy on people because we’ve just finished Christmas and the new year signifies fresh beginnings. I feel as a finance blogger who specializes in budgeting, debt and frugal living that I should always send out a yearly reminder about the importance of budgeting for everyone. This is why financial and personal goals start at the beginning of the year for most people at which time they are 100% committed, for a minute and then forgotten. Don’t lump yourself in that pile because you’ll never get ahead without that drive to succeed. By all means you don’t need to use a budget to be successful but I fully believe that using a budget will always outweigh not using one. Not everyone who wants to start a personal budget plan fails but a good majority of people have the get-up and go to start with but it doesn’t last long. Why does this new years phenomena of changing our lives and goal-setting sound so good but then get lost in the chaos of life? Likely because for some people their personal budget plan is unrealistic, too difficult or enough time wasn’t set aside to budget. As you will read in our 10 Step Budgeting Series that will still follow today planning is of the essence. You won’t have muscles but you’ll have savings and spending power and those to me are just as great as being able to lift weights. Increasing wealth naturally will happen if you continue to use the same or similar footsteps to financial independence. How likely are you to become debt free from using a budget? VERY as long as you stick with it and are results driven. There is no greater feeling than knowing you are debt free. Being rich is nothing like what debt freedom feels like only because happiness is the new rich. This means that more people wish to have zero debt rather than becoming rich because odds are not everyone will roll in cash like a superstar. You MUST be serious about your personal budget plan or it won’t work. I’ve always been an up-front kind of guy about money and budgeting but don’t waste your time if you aren’t planning to commit. No excuses-NONE. I’m the type of guy who will always lend a helping hand or an ear to listen but if the person is not showing signs of commitment to a personal budget plan, I walk away. Sounds harsh but almost always they will come back to me without fail pumped to get their personal budget plan up and running. You see, the key to remember is that no single budget will pay your debt, only you will and you must have the cash to do so. It’s imperative that you start by creating a solid personal budget plan and then move on to using a budget. Depending on how you would like to budget I often suggest if it is the first time you’ve created a personal budget plan that you use pen and paper or a budget spreadsheet. You can download our budget spreadsheet for free which thousands of people have done successfully. Exciting to get feedback on our budget too! The reason I suggest this is because writing and typing on a computer will not only motivate you better but using a cell-phone to budget using a budget app might get lost in the pit of social media. Ideally, if you are easily distracted you may want to close all of your social accounts and focus solely on your personal budget plan and the actual budget. This is why I will always suggest setting time aside to budget in a quiet place without distraction. You will need this as money management can be difficult to focus on when kids are screaming, phones ringing and having to rush out to appointments or for shopping trips. If after the kids go to bed works for you, then go for it. Before our son was born we would budget any time of day but now we focus on our budgeting plan by setting time aside after our son is sleeping. Typically this could be from 7-10 each evening. There might be nights where you have no information to input into your budget spreadsheet which means you have free time to do other things related to your finances. This may mean creating a budget binder organizer or thinking about other goals you’d like to crush for the year. There really is no easy way to say budgeting is fun because it’s not. In fact, it’s boring and the only plus side is seeing those fabulous numbers at the end of each month in hopes that our personal budget plan is working. If you want to start the year off with a solid budgeting plan don’t wait until January 1 to start thinking about it. You MUST have your personal budget plan in place to start the month off right. Even if you don’t start in January move on to February provided you have went through the list below. Please don’t rush a budget because it will end up owning you and you’ll resent that and quit. Commit or don’t start a personal budget plan including your biggest fears and problems that are creating debt in your life. If you don’t know why then you can’t fight back. Ask yourself why you want to budget your money and Write It Down! This is a great time to consider you budget goals and steps you’d like to take to make budgeting a priority. Find motivational reasons to start and continue budgeting. This may be notes you attach to your refrigerator or sayings that keep you on your toes. An example might be, “Don’t forget to price-match and save money” or “We have debt and debt freedom tastes better than take-out”. Remove weaknesses from your expensive social circle or come up with good excuses or the truth so you don’t have to feel awkward when your friends want you to hang out and spend money. Find a space in your home that is dedicated to budgeting and quiet time such as an office, spare bedroom or a basement space. Locate all of your bills and debts and document them on paper or on a spreadsheet. This is so you can see exactly how much you owe and who you owe it too. Then you will want to add it all up so you have an idea of how much debt you have. Read all you can about budgeting from a trusted budget source. Not all budgeting blogs or bloggers are budget experts. Follow those who have conquered debt from start to finish and know what they are talking about. If you are unsure about your personal budget plan ask for help. Review the different types of budget options available online and find one that is right for you. If this is the year that you want to just stop SPENDING MONEY then consider a spending ban, budgeting everything and finding out just how much fun it is to get rid of debt once and for all. Discussion: Do you create a personal budget plan before starting your budget? Why or Why not? Leave me a comment below and I’ll respond. Well explained to kickstart new year but balancing the budget is something I am concerned mostly. Well, I don’t have really that issye now but actually looking to buy a new vacation property in Belleville. My and my wife both are working and I think downpayment shouldn’t be any problem but what we struggle at is mortgage calculations. I think I need one professional to discuss before approaching to the bank. I don’t want to stumble around at the beginning of year so my rest financial plans are in line.